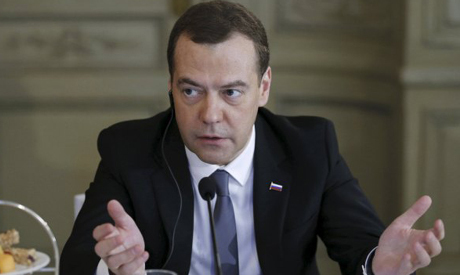 Russian Prime Minister Dmitry Medvedev said Saturday that strains between Russia and the West have plunged the world into a "new Cold War". With tensions high over the lingering Ukraine conflict and Russia's backing of the Syrian regime, Medvedev said: "All that's left is an unfriendly policy of NATO against Russia". "European politicians thought that creating a so-called belt of friends at Europe's side, on the outskirts of the EU, could be a guarantee of security, and what's the result?" he said. "Not a belt of friends but a belt of exclusion." He urged better East-West dialogue, citing the "shining example" of the historic meeting of Pope Francis and Russian Patriarch Kirill in Cuba. Medvedev added that "in the 1960s we were on the brink of nuclear apocalypse, but the two enemy sides understood that no conflict of political systems was worth the lives of people." NATO general secretary Jens Stoltenberg had earlier addressed the forum on the subject of tensions with Russia, vowing a firm stance while also offering dialogue. "We have seen a more assertive Russia, a Russia which is destabilising the European security order," he said. "NATO does not seek confrontation and we don't want a new Cold War. At the same time our response has to be firm." NATO was now "undertaking the biggest reinforcement to our collective defence in decades, to send a powerful signal to deter any aggression or intimidation. Not to wage war, but to prevent war." Stoltenberg charged that "Russia's rhetoric, posture and exercises of its nuclear forces are aimed at intimidating its neighbours, undermining trust and stability in Europe." He stressed that "for NATO, the circumstances in which any use of nuclear weapons might have to be contemplated are extremely remote" and cautioned that "no-one should think that nuclear weapons can be used as part of conventional conflict". The NATO chief said that "some are concerned that we are sleepwalking toward escalation with Russia... I understand those concerns but I do not share them." He urged a "more constructive and more cooperative relationship with Russia... I strongly believe that the answer lies with both more defence and more dialogue."